K. Gibbs & E. White - Danisco Animal Nutrition, DuPont Industrial Biosciences, Marlborough, UK D. J. Cadogan & S. J. Wilkinson - Feedworks Pty Limited, Romsey, VIC, Australia. 450 day-old male Ross 308 chicks were randomly allocated to 3 dietary treatments with 6 replicate pens per treatment and 25 birds per pen. Diets were supplemented with 500 FTU commercial phytase and a xylanase and beta-glucanase mixture (XB; to provide 1220 U xylanase and 152 U betaglucanase/kg feed) alone or in combination with 75,000 CFU/g feed or 150,000 CFU/g feed of a 3 strain Bacillus spp. combination. Supplementation of the Bacillus probiotic numerically and significantly improved bodyweight corrected feed conversion ratios (FCRc) in diets containing XB. Digestible calcium and phosphorus were also increased when Bacillus were supplemented on top of diets containing XB. 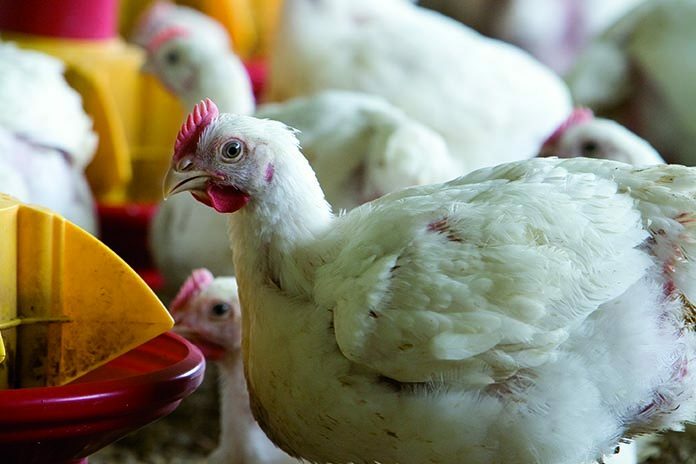 Bacillus-based probiotics have gained increased attention as alternatives to antibiotic growth promoters (AGP) to support broiler performance in systems aiming to reduce the use of antibiotics and maintain gut health and function. 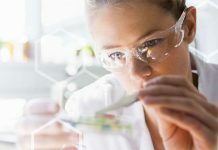 Combatting poor gut health and disease susceptibility in an era without antibiotics has been made increasingly difficult due to the increasing cost of commercial feed ingredients. This has forced some producers to use cheaper dietary alternatives including by-products (such as corn distiller’s dried grains with solubles, corn DDGS, and wheat middlings) which often contain high levels of antinutritional factors such as non-starch polysaccharides (NSP). Consequently, feed enzymes, such as carbohydrases and phytases, have been increasingly used in animal feed to increase the nutrient availability and utilization of ingredients and confer beneficial changes to intestinal microbial populations and support gut health through described prebiotic modes of action. With no “silver bullet” available to replace antibiotic use, it is important to understand how different alternatives can support gut health and bird performance. 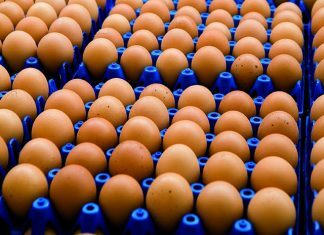 This study aimed to evaluate the effect of multiple enzymes in combination with Bacillus probiotics on nutrient digestibility and broiler performance when fed typical Australian diets. 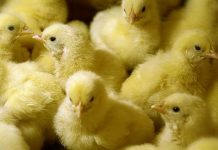 The study was conducted at the University of Sydney and protocols were approved by the university’s ethical committee 450 day-old male Ross 308 chicks were randomly allocated to 3 dietary treatments with 6 replicate pens per treatment (25 birds/pen). Prior to the trial, the birds were vaccinated against infectious bronchitis, Marek’s disease and Newcastle disease. 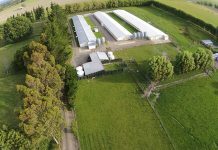 The trial was conducted in a deep litter broiler shed and ran for 42 days. All diets were supplemented with 500 FTU commercial phytase and a xylanase and beta-glucanase mixture (XB; to provide 1220 U xylanase and 152 U beta-glucanase/kg feed; manufactured by DuPont Animal Nutrition) alone or in combination with 75,000 CFU/g feed or 150,000 CFU/g feed of a 3 strain Bacillus spp. combination. Diets were pelleted (80 °C, 100 kPa pressure) and fed ad libitum; starter diet from day 1 to 15, grower diet from day 16 to 28 and finisher diet from 29 to 42. At the end of each phase, feed intake and bodyweight were measured to calculate bodyweight gains and feed conversion ratios. Additionally, on day 28, 5 birds from each pen were euthanized and the ileal contents were collected and pooled per pen for nutrient digestibility calculations according to the methods of Ravindran (et al., 2005). 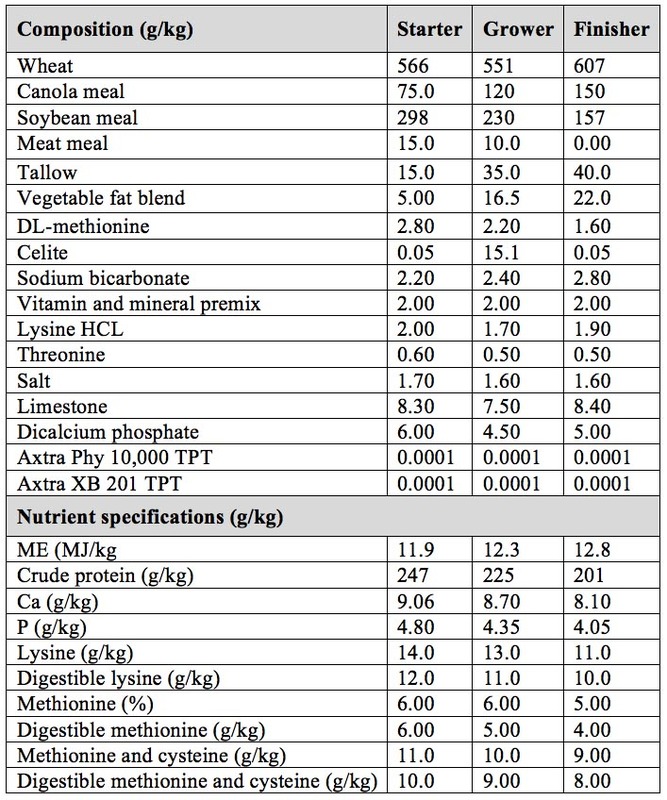 Table 1 – Dietary composition and nutrient specifications of starter, grower and finisher diets. Overall (1-42 days), Bacillus probiotic supplementation at 75,000 and 150,000 CFU/g feed, combined with XB, significantly (P < 0.05) improved FCRc by 7 points (4.5%) and 8 points (5.2%), respectively, compared to enzyme supplementation alone. Furthermore, there was no significant difference in FCRc in diets containing XB when the Bacillus probiotic was supplemented at either 75,000 CFU/g or 150,000 CFU/g of feed. No significance differences in either feed intake or bodyweight gain were detected with probiotic supplementation in diets containing XB. Digestible calcium and phosphorus were significantly (P < 0.05) increased by 68.4% and 17.5%, respectively, with the inclusion of the Bacillus probiotic at 150,000 CFU/g feed in combination with XB, compared to XB alone. Supplementation of the 3-strain Bacillus probiotic in diets containing XB improved broiler performance. Bacillus probiotics are well documented to support gut development, in turn allowing nutrients from feed enzymes to be absorbed more efficiently. Interestingly, in diets containing XB at higher dose of the Bacillus probiotic did not show further significant improvements in bird performance. This could support the inclusion of a lower probiotic Bacillus dose, potentially making it more economically viable. Such feed enzyme and Bacillus probiotic combinations have been shown to be efficacious in situations of gut health challenge including coccidiosis and necrotic enteritis (Dersjant-Li et al., 2016). Gut health related issues are costly to the global market. Complex diets and the inclusion of plant byproducts negatively impact gut health by increasing the viscosity of the digesta, slowing intestinal transit and allowing the proliferation of non-beneficial microbial populations. An excess of undigested crude protein in the lower gut is associated with necrotic enteritis. It is therefore understandable how feed enzymes can be a key component of any gut health strategy. Improving the digestibility of the diet and reducing the undigested fraction reaching the distal gut is one mechanism for improving gut health. Bacillus based probiotics have well documented benefits in supporting the colonization of a beneficial microbiota and thus supporting optimal gut development and functionality both under unchallenged and challenged conditions. In turn, this has been shown to improve gut function and ultimately bird performance. In conclusion, feed enzymes in combination with Bacillus based probiotics can be used to improve nutrient digestibility and bird performance. Table 2 – Effects of a 3-strain Bacillus and XB on bird performance. ab Means within a row with different superscripts differ (P < 0.05). (ab) Means within a row with different superscripts differ (P < 0.10). FCRc is bodyweight corrected FCR, 3 points in FCR for every 100g difference versus control. 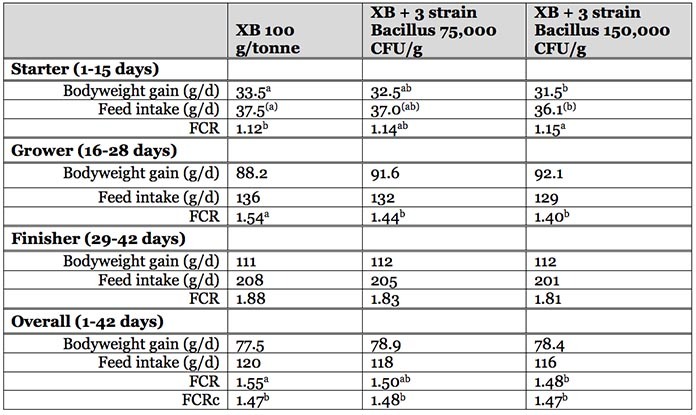 Table 3 – Effects of a 3-strain Bacillus and XB inclusion on ileal digestible calcium and phosphorus at 28 days.